Spas and hot tubs in particular require quite a bit of energy in order for them to be heated properly. Otherwise, they are no more useful than an ordinary swimming pool. So it can be worth it to research the best kind of spa heater that you can buy, depending on the size of your spa or hot tub. For spas and hot tubs, the heating system is a bit smaller than with regular swimming pools, especially since they don’t need to heat as much water. The Hayward CSPAXI11 in particular is fairly small, with a dial on front to control the temperature. It’s pretty simple to operate and install, with full instructions in case you get stuck. 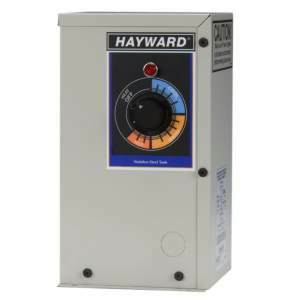 This Hayward unit heats at a rate of about 5 degrees Fahrenheit per hour, so the time it takes to get to a comfortable temperature can vary quite a bit depending on how cold or warm the water already is. Generally it’s safe to say that it will take around 4 to 6 hours or so to heat most spas or hot tubs. Do note that you need the appropriate power hookup and wire to ensure continued operation. The manufacturer recommends number 6 wire with a 60 amp breaker, with a 240 volt hookup. You may be able to get away with a lower amount of amps, but for reasons of both safety and efficiency it’s best to follow the manufacturer’s advice. The Hayward CSPAXI11 can heat spas and hot tubs as large as 1,000 to over 2,500 gallons in volume. It should be able to adequately heat the majority of spas and hot tubs on the market. Although if it’s any bigger than 2,500 gallons, you may want to shop around for more powerful spa heaters. Otherwise, the water will be heated very evenly and efficiently, with a lot less resources used since it’s purely an electric heater. As far as spa heaters go, this is one of the cheaper units you can buy, especially when compared to traditional propane-based heaters. At $449, it’s about half as expensive as comparable gas hookups, and will also cost you a lot less in the long run since the only resource it uses is electricity. Beyond that, the small size and simplicity of its electronics means that there are far less parts that can break down, saving you money on repair or replacement costs. Honestly it’s hard to go wrong with a purchase like this. It works exactly as advertised, and it will continue to work for many months and years with typical usage. It’s also from a brand that’s well-established and has made pool and spa heaters for several years. Hayward generally manufacturers highly efficient and functional pool heaters. Overall, with its ease of installation, ease of use, and small size, the Hayward CSPAXI11 is a recommended choice for most personal spas and/or hot tubs. It gets a rating of 4.5 out of 5 stars. Do you prefer electric or natural gas heaters? Do you have any experience with this Hayward model or any other of their models? Leave us a comment! My Las Vegas home has a 61′ x 15′ x 5″ swimmingpool that is heated by 96 Solar Tubes with an additonal 48 Solar Tubes and a heat exchanger that can also contribute to heating the pool. I am at 4,000′ elevation and it gets below 30 degrees in the winter with the pool staying in the low 70 degree range. I am off the grid and have 60 solar panels and 2 wind turbines that provide my power. Electricity is free but not at unlimited supply. Gas and heat pump are not an option. Are there some highly efficient electric pool heater that my be able to assist my solar system? The only time an electric resistance heater (11KW) makes sense, is if it’s your only option because of space requirements, that is the case with most indoor portable spas. It is one of the most expensive ways to heat a pool or spa along with liquid propane (LP). At least with an LP gas heater, it will heat your spa fast. A heat pump is the best and most efficient way to heat a pool / spa with heat on demand. Most heat pump pool / spa heaters are about 80% more efficient than gas or electric resistance heaters. Heat pumps will not operate in temperatures below 40f and most won’t operate in temps below 50f. If you require heat in temps below this, your best option is a heat pump with a gas heater backup.